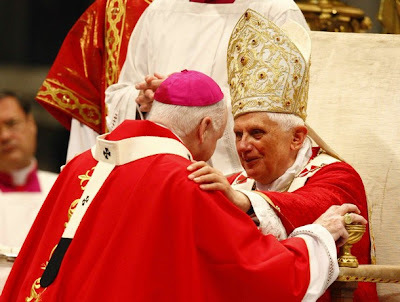 On this feast of Rome's Christian founders -- the 57th anniversary of Joseph Ratzinger's ordination to the priesthood -- Uncle Bart remained at Papa Ratzi's side as 40 new metropolitans from across the globe received the symbol of their office, the pallium. Among the prelates who came forward to receive the traditional lambswool band were the recently-named archbishops of Nairobi, Moscow, Jerusalem, Taipei, Lille, Minsk, Mobile, Halifax, Baltimore and St Paul and Minneapolis. With the statue of St Peter in the nave of the Vatican basilica decked out in its usual finery for the day, the morning liturgy also saw two evolutions in papal worship from last year's feast: a new (fiddleback-friendly) "papal pallium," and the continuation of the restored custom of the pontiff's distribution the Eucharist on the tongue to kneeling communicants. Unity and collegiality, "romanità" and universality, ecumenism and mission were woven together in the words of Bartholomew I and in those of the pope, while the assembly applauded both. 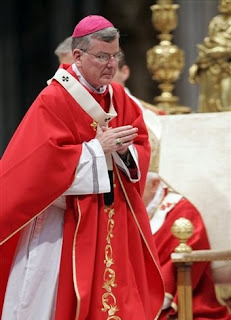 No risk of ritualism or of abstract theology: all of the emphases, the search for theological and pastoral unity, the symbol of the pallium, the very commemoration of the martyred apostles are a function of the mission to the world, for "peace" - as Bartholomew I said - or in order to bring about, as the pope said, "a new kind of city that must be formed continually anew in the midst of the old human city, which remains under threat from the opposing forces of sin and human egoism". 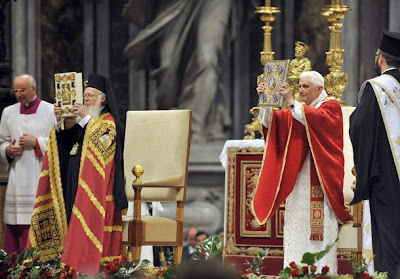 After the proclamation of the Gospel, Benedict XVI introduced the address by Bartholomew I, which emphasised the profound unity and friendship that binds Constantinople ("the new Rome") and the "old Rome". He affirmed that theological dialogue "continues forward, beyond the considerable difficulties that remain and the well-known problems", and expressed his hope that soon, "as soon as possible", full unity may be reached. The visit of the delegation from the patriarchate to Rome for the feast of the holy apostles - which has become a tradition - is itself an expression of this desire, and of a form of unity already present. This year, Bartholomew I himself wanted to be present in order to repay the pope's visit to Constantinople last November, but above all to inaugurate together the Pauline Year, at the 2000th anniversary of the birth of Saint Paul. Bartholomew I said that for them as well, this is "the Year of the apostle Paul", in which the Church of the East has planned pilgrimages to Rome and to the places of the apostle's activity in Turkey (Ephesus, Miletus, etc.) and to Greece, Rhodes, and Crete. In his homily, the pontiff emphasised above all the value of Rome, as the place of the martyrdom of the two apostles: "Through their martyrdom, they became brothers; together they were the founders of the new Christian Rome". And he added: "The blood of the martyrs does not call for vengeance, but rather reconciles. It does not present itself as an accusation, but as 'luce aurea' . . . as the power of love that overcomes hatred and violence, thus founding a new city, a new community. Because of their martyrdom, they - Peter and Paul - are now part of Rome: through martyrdom, Peter as well became a Roman citizen forever. Through martyrdom, through their faith and love, the two apostles show where real hope lies, and are the founders of a new kind of city that must be formed continually anew in the midst of the old human city, which remains under threat from the opposing forces of sin and human egoism". Benedict XVI asked "why" Peter and Paul came to Rome. "[For Paul,] going to Rome was part of the universality of his mission to all peoples. The road to Rome . . . was an integral part of his task of bringing in the Gospel to all the gentiles - of founding the catholic, universal, Church. Going to Rome was for him an expression of the catholicity of his mission. 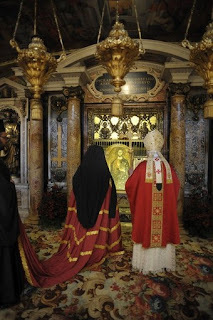 Rome must make the faith visible to all the world, it must be the place of encounter in the one faith". For his part, the pope continued, Peter is the one who opened the doors of the pagans to the Christian faith (see the episode with the centurion Cornelius, Acts 10). "Peter", the pope explained, ". . . left the leadership of the Christian-Jewish Church to James the Less, in order to dedicate himself to his true mission: to his ministry for the unity of the one Church of God formed from Jews and pagans. St Paul's desire to go to Rome emphasises - as we have seen - among the characteristics of the Church, above all the word 'catholic'. St Peter's journey to Rome, as representative of the peoples of the world, falls above all under the word 'one': his task was that of creating the unity of the catholica, of the Church made up of Jews and pagans, of the Church of all peoples. And this is the permanent mission of Peter: to make it so that the Church never be identified with a single nation, with a single culture or a single state. That it always be the Church of all. That it unite humanity beyond all boundaries, and, in the midst of the divisions of this world, make present the peace of God, the reconciling power of his love". 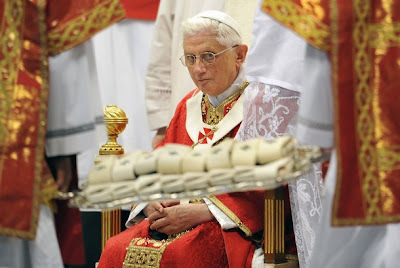 "When we take the pallium upon our shoulders", the pope explained, "this gesture reminds us of the Shepherd who takes upon his shoulders the lost sheep, which on its own was not able to find the way home, and brings it back to the fold". But Jesus Christ "also wants men who will 'carry' together with Him" lost humanity. "The pallium", he added, "becomes a symbol of our love for the Shepherd, Christ, and of our loving together with Him - it becomes a symbol of the call to love men as He does, together with Him: those who are searching, those who are questioning, those who are sure of themselves and those who are humble, the simple and the great; it becomes a symbol of the call to love all with the power of Christ and in view of Christ, so that they may find Him, and in Him, themselves". The pallium, he added finally, is a sign of collegiality, of unity among all the bishops and with the pope: "No one is a Shepherd on his own. We are successors to the Apostles thanks only to being in collegial communion, in which the college of the Apostles finds its continuation. 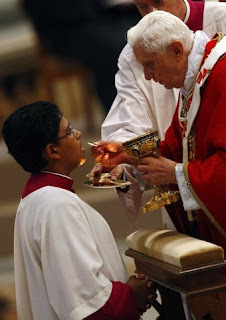 Communion, the 'we' of the Shepherds, is part of being Shepherds, because the flock is only one, the one Church of Jesus Christ And finally, this 'with' also refers to communion with Peter and with his successor as the guarantee of unity".